BIO: Hi there, my name is Angel. I was surrendered to SCBR because my elderly owner was unable to continue to care for me, due to her own health issues. I am a real cuddler. I get along great with other dogs, cats and responsible children. I am just a gem of a girl. Because I came from a home where it was just me and my elderly owner, I am really looking for the same type of lifestyle. Someone that is home most of the day. I am an excellent companion for watching TV, I like going for walks and absolutely love being loved on and cuddled with. I am pee pad trained, and with a little refresher course could be re-house trained. I am not shy, but neither am I boisterous. I have a lot of love to give, I just need someone to share it with. I am UTD on all vaccinations, heartworm negative and micro-chipped (w/lifetime registration). You must have a completely fenced and secure yard (not electric or invisible) in order to adopt me. I am currently being fostered in Almont, MI. **UPDATE:Angel was adopted 8/6/17 by a very loving family in Allenton, MI. It was love at first sight for everyone. BIO: Hi there, my name is Belle. I was surrendered to SCBR by my owners because I had turned out to be more of a puppy than they had planned on. I was purchased as a puppy to be a companion to their 9yro German Shorthair Pointer, but he tired of me very quickly. I had too much pep in my step and his battery ran down a lot quicker than mine did. It had been a while since my former owners raised a puppy and realized that their stamina was not as young and long-lasting as mine was. They gave it a lot of consideration and felt that re-homing me to another family with children and a younger dog would be best for everyone concerned. I do fantastic with other dogs, children and adults as well. I love to run and play. I am housetrained (I even ring a bell to let you know I need to go out), crate trained, UTD on all vaccinations, micro-chipped, heartworm negative and on heartworm preventative. I am a very loving and attentive dog that with the correct training can become a very valued member of your family. My only downfall, as far as my former owners are concerned, is that I like to chew things. I can “kill” and gut a stuffed toy in five seconds flat. BUT in my own defense, I am still a puppy and puppies do a lot of chewing out of boredom and frustration. I am at the perfect age that in addition to the endearing qualities I already have, I could really excel with additional training. I am not a real hyper dog and I mind very well. I do like going on walks and even though I have not been on many, I could use a little leash training. My foster Mom thinks I am a real treasure. SO if you are looking for the perfect companion to complete your family, look no farther – I am the girl. You must have a completely fenced and secure yard (not electric) in order to adopt me. I am currently being fostered in Almont, MI. Appears to be cat-friendly. **UPDATE: Belle was adopted 4/12/17 by a very loving family in Royal Oak, MI. BREED: Shih Tzu / Yorkshire Terrier mix? BIO: Hi there, my name is Gidget. I was picked up running scared on the highway by a kind woman on her way home from work. She was unable to keep me or look for my owners, but couldn’t bear the thought of what would happen to me had she not picked me up. I was surrendered to SCBR because she knew I would find a new forever home. SCBR checked all the lost and found sights but could not find a post showing that anyone was looking for me. It’s no wonder, I was infested with fleas and in heat when found. I was taken to the groomer and had three flea baths and the little varmints were still crawling all over me. I was then taken to the vets and given a Capstar, which finally seemed to do the trick, thank goodness. I was also loaded with worms, to the extent that I looked like I might even be pregnant. The vet palpitated my abdomen and ruled out the pregnancy prior to me being spayed. I was then wormed so now I am varmint free inside and out. The vet feels I am probably about 18 months old. I am now spayed, fully vaccinated, heartworm tested, on heartworm preventative and micro-chipped w/lifetime registration. I am house trained and crate trained. I get along great with other dogs my own size (I am a little leery being around larger dogs). I love children and I would be best suited in a home with children 8yrs or older. I love to go on car rides and walks, but I really love to be on your lap being loved and petted. I am such a little munchkin. So if you are looking for your new best friend and companion, I just might be your girl. You must have a completely fenced and secure yard (not electric or invisible fence) in order to adopt me. I am currently being fostered in Imlay City, MI. I am cat friendly. **UPDATE: Gidget was adopted 10/8/17 by a very loving family in Bloomfield Hills, MI. It was love at first sight all the way around. She melted right into their arms and was ready to go home. BIO: Hi there, my name is Griffin. I was surrendered to SCBR by my Mom with the hopes of me finding a new “forever home”. I was purchased from a breeder in Arkansas when I was four months old. I am AKC registered. My Mom was very active up until a couple of years ago. I was raised with cats and small dogs and all went well until a couple of years ago when I ended the life of one of her outdoor cats. From there, it progressed to my intolerance of her indoor cats and her very small indoor dogs. The rescue thinks that this might be due to the fact that up until a couple of years ago my former Mom used to take me to a class where a bunch of dogs, with their handlers, would sit and read to children and I loved it. I passed my “Canine Good Citizen” course and was used as a therapy dog. The rescue thinks I was probably lacking the attention and motivation that I had previously and was trying to remove all the other animals that I felt were infringing on my attention. I stopped going to read with the children because I began to show that I didn’t want to share their attention with the other dogs in the group. I get along fine with children and adults. While I was at SCBR’s facility, I showed no animosity towards any other animals, but I was still a little apprehensive of cats. I am UTD on all vaccinations, microchipped, heartworm negative and housetrained. I have no problem being crated or kenneled. I was so depressed that I would not eat anything for a week. They soon realized that I was so starved for affection and companionship that once I received it, I did a complete turnaround and began eating again. So if you are looking for a devoted companion – I just might be your guy. My foster Mom’s children began reading to me and it gave me a purpose to live again. I do walk well on a leash. You must have a completely fenced and secure yard (not electric or invisible) in order to adopt me. I must go to a home WITHOUT CATS. I am currently being fostered in Imlay City, MI. **UPDATE: I was adopted on 2/4/17 by a very loving and caring woman in W. Bloomfield, MI. My new Mom had recently and quite unexpectedly lost her beloved Sophie and was grieving terribly. At first she questioned whether or not she had made the right decision by “jumping in” and adopting so soon. After a lot of tears were shed we both realized that we were meant to be. BIO: Hi there, my name is Jackie. I was rescued from a high-kill shelter in North Carolina in 2016. My Foster Mom saw my post on Face Book and I touched her heart in a really big way. Thanks to the tremendous efforts and great teamwork of other rescues, I was pulled, housed, groomed and transported from North Carolina to Ohio. My Foster Mom met one of the transport teams and brought me home to Michigan in January 2016. It was a very long ride and of course the weather was horrendous (blizzard) but we all made it back home safe and sound. I am just the happiest girl in the world. I absolutely love everyone and everything. I love belly rubs and I love to play. I love being outdoors and would make a fantastic walking partner. I am housetrained, walk well on a leash (with a harness) and ride well in the car. I would love nothing more than to have my very own “forever” home and family. Regretfully, I was adopted out to a family just long enough for my vaccinations to expire, but was supposedly returned because they didn’t have the proper amount of time to spend with me and they felt I had became too needy of their time. (Come to find out when we took her back in to get her vaccinations updated and heartworm tested again – she tested positive for heartworm. We keep all of our rescues on heartworm, flea & tick preventative while in our care. When they are adopted out the new owners receive a one month supply of these preventatives with the understanding they will continue as directed. Well, obviously that didn’t happen. Jackie was tested five times in a row for heartworm because the results kept going back and forth between positive and negative. We decided to go ahead and have her treated for heartworm just to be safe. Jackie is finally heartworm free and after months of painful treatments, having to be kept still while she recovering and the additional financial burden that was unnecessarily put on the rescue – Jackie is now able to be adopted.) So if you are in need of a loving and loyal companion, or are sad, lonely or depressed, look no further – I am your girl. I have all kinds of love to give, I just need someone to share it with. I am very neat and clean and have never had any accidents in the house. I must go to a home WITHOUT CATS or small animals because I am very prey driven so if you have a problem with cats or squirrels in your yard, I can take care of that problem. I would be best suited in a home with adults that are looking for a loving companion. I do love playing with children and other dogs. I am quite satisfied in just being your one-and-only. I am good with children, but because of my high prey drive, if they run, I will probably chase them. In the house I am very reserved and will just lay by your feet or on a rug. I am a little skittish at first, probably from being bounced around so much. I don’t do well with a lot of commotion, it makes me very anxious. Everyone that has met me, vets included, have remarked about how good of a girl I am. I am so quiet in the house that if you didn’t see me, you wouldn’t even realize I was there. Won’t you give me the opportunity to show you how correct they are? I am UTD on all vaccinations, micro-chipped (w/lifetime registration). You must have a completely fenced and secure yard (not electric or invisible) in order to adopt me. I must go to a home WITHOUT CATS or small animals, I am very prey driven. I am currently being fostered in Imlay City, MI. **UPDATE: Jackie was adopted 8/17/17, by a phenomenal couple in Ann Arbor, MI and their dog named Franklin. This is the day we were all hoping and praying for. It was love at first sight for everyone. After all Jackie has been thru, we were patiently waiting for the “perfect” family to open their hearts and home to sweet Jackie, and we finally found them. We have already received pictures and updates and everyone is doing fantastic and they all love her to death. 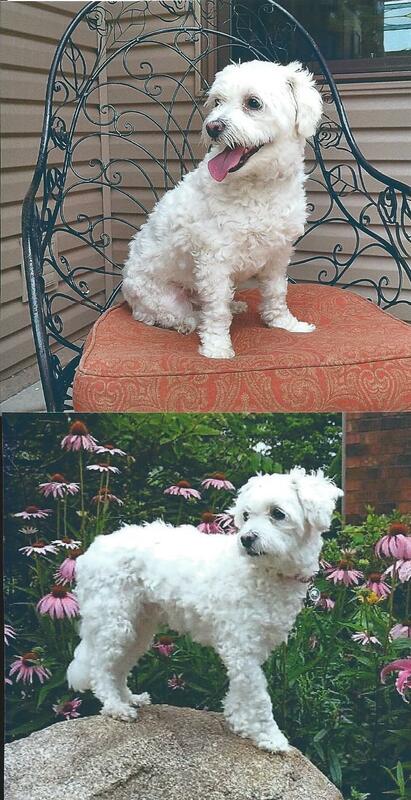 The top picture is of Jackie patiently waiting for her new forever family. The middle picture is of the entire family when she was adopted. The bottom picture is of the entire family on one of their walks after they brought her home. It was a very happy day for everyone. BIO: Hi there, my name is Jasper. Don’t let my pictures fool you, I am a purebred Papillon, but had to be shaved down a little when I was groomed in order to be squeaky clean for my vet appointment to be neutered. My Foster Mom says I am a GREAT little dog. I am very active and healthy. I am a real snuggler and I absolutely LOVE going for walks. I have quite a little prance and real pep in my step. I do play the “tough guy” with larger dogs or dogs that are exceptionally “nosey”. But as soon as I feel comfortable, I blend in well with everyone. I was surrendered to SCBR because my Dad passed away last December and my Mom had to move into a condo, where I was not allowed to stay. I am very adaptable to new situations, very loveable, a good eater and just a wonderful little dog (if I do say so myself)!!! So if you are looking for a little ball of fur to spend your lonely days and nights with, I am definitely your guy. I am just the right size to fit on all laps and am a very good listener. I am looking forward to a kind and loving fur-ever home that needs me as much as I need them. I really need a “stay at home Mom and/or Dad to call my own. I need a safe and secure environment without a lot of children and other animals wreaking havoc. I am house and crate trained and UTD on all vaccinations and micro-chipped w/lifetime registration. Although the rescue normally requires a completely fenced and secure yard (not electric or invisible) in order to adopt any of their rescues, consideration could possibly be made if I was always kept on leash when leaving my new home. The rescue is willing to adjust my adoption donation in order for me to find the right home. I am currently being fostered in Almont, MI. **UPDATE: Jasper was adopted 4/7/17 by a very loving and caring family in Northville, MI. Here is a picture of Jasper with his new Forever Mom and his Papillon brother named Rico. BIO: Hi there, my name is Nahlia. I was fed, watered and saved by a neighbor because my former family moved and left me chained outside all winter without any protection. I had a sister, but no one knows what happened to her once my family left us there. I get along fine with people and older children. Due to the fact that I never knew where, when or if my next meal was coming, I am very food attentive especially if there is another dog or people around me when I am eating or if someone else is eating something. I am like a canine vacuum cleaner when it comes to food but now that I am learning that I will get fed regularly I am getting a little better. I would be best suited in a home where there are no other animals, and with a family that is familiar with Dobermans. I am housetrained but I do not crate well. I know basic commands and walk well on a leash. I am very playful and enjoy being around people. I really am a good girl, I just need to get my confidence restored and my manners worked on since I was not cared for very well by my previous owner. There has been quite a lot of interest shown in adopting me, however most the interested parties did not meet the requirements that the rescue has set for me to be properly adopted. I am UTD on all vaccinations, heartworm negative and micro-chipped w/lifetime registration. So if you are looking for a devoted companion, I just might be the right girl for you. You must have a completely fenced and secure yard (not electric or invisible fence) in order to adopt me. I am currently being fostered in Imlay City, MI. Not cat friendly. **UPDATE: Nahlia was adopted 8/1/17 by a very loving and Doberman fsmilist family in Wolverine Lake,MI. BREED: Bassett Hound / Corgi mix? BIO: Hi there, my name is Poppy. I was originally purchased when I was 8 weeks old by a family as a companion for their older Cocker Spaniel. My former Mom thought she would be doing her other dog a big favor by getting him a companion to keep him company while she went back to work – however the Cocker Spaniel decided that I was just too puppy for him. So it was in everyone’s best interest that I be surrendered to SCBR so I could get a loving home where I could be properly trained and cared for. When I was five months old I was adopted by a family that had small children. Fast forward, six months later, I am once again looking for my forever home. I am a very exuberant puppy and have a bad habit of jumping up on people and children because I am so excited and want to play. My current Foster Mom is working on letting me know that it is unacceptable for me to jump on people. I love to play with other dogs and age appropriate/responsible children. Due to the fact that I am young and so active, it is not recommended that I be adopted by a family with children under 8yrs old. I walk fairly well on a leash and love to play, go for walks and car rides. I am house trained (will whine when I need to go out) and am also crate trained. So if you are in the market for a new companion and best friend, I just might be your girl. If you have an energetic/tolerant dog that is in need of a companion or playmate, this could be a win-win situation. There is no better teacher than a dog that already knows the rules and expectations of your home. The best way for me to learn is by example. My Foster Mom has made tremendous strides in helping me to realize my potential while being firm enough in her commitment to correct me if I cross the line. She has taught me basic commands and I am responding quite well. I am still young enough that you could receive the rewards of properly training me and molding me into everything you have ever wanted. I am UTD on all vaccinations, micro-chipped (w/lifetime registration). You must have a completely fenced and secure yard (not electric or invisible) in order to adopt me. Not cat friendly. I am currently being fostered in Imlay City, MI. **UPDATE: Poppy was adopted 8/20/17 by a wonderful young couple in Westland, MI. They have no children and no other pets and Poppy gets to be their #1 baby. 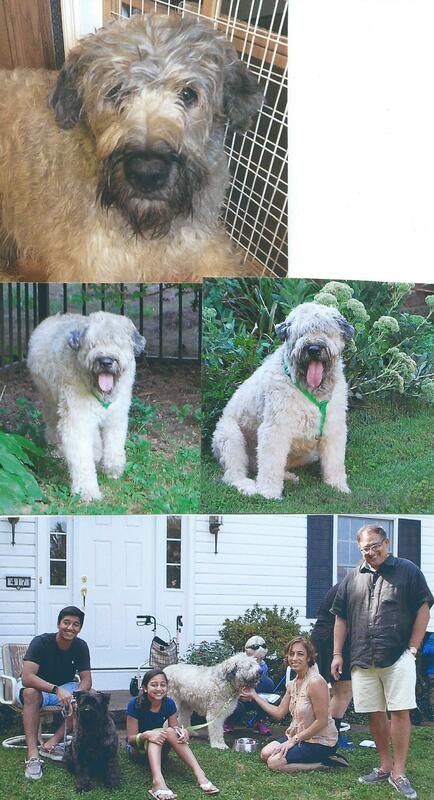 BIO: Sammy was surrendered to us because his very elderly owner passed away suddenly. He was purchased at eighteen months young and was only with his owner for six months. Due to his owners’ age and health, Sammy was not house trained, socialized or had any knowledge of what it meant to play. Both of his ears were severely infected, which we have addressed. He just very laid back and let the world pass him by. Nothing or no one phased him or peaked his interest. He was a blank slate. Now that he has been with his very patient and loving Foster Dad Sammy is doing a phenomenal turn-around. The vet felt Sammy should lose 10-15 pounds. Right now he is on a managed diet and his Foster Dad takes him on 2-3 daily walks in addition to him having a huge fenced in yard to run and play in. Slowly but surely his weight is coming off. Sammy is now house trained, and is finally learning how to play with stuffed toys. Sammy is UTD on all vaccinations, microchipped, heartworm negative and on monthly preventative. Sammy is being fostered in Mechanicsburg PA. The approved adopter must be willing to drive to PA with their entire family (2 and 4 legged) for a meet & greet. Because Sammy lived alone we feel he still requires more socialization and interaction with people, and therefore would not consider really young children in his immediate future. Sammy is interested and curious about children. Sammy does not appear to have any separation anxiety, and had no reaction to storms. So, if you are willing to open your home and heart to a very deserving young boy, and you are willing to gradually mold him into the loving dog he deserves to be, please fill out and submit an application. If you need more information please state your concerns on the application and I will put you in touch with our PA coordinator. You must have a completely fenced and secure yard (not electric or invisible) in order to adopt Sammy. We are assuming he is not cat friendly. **UPDATE: Sammy was adopted 9/17/17 by a very loving family in Pittsburgh, PA. Sammy not only has a 5yro Bouvier sister, but also three two-legged siblings and a loving new Forever Mom & Dad. BREED: Basenji / Dutch Shepherd mix? BIO: Hi there, my name is Sheba. I was surrendered by my Dad because of the amount of hours he worked and his not thinking it was fair for me to be crated for so many hours a day. I am very good with and play well with children and other dogs my size. I love toys and to be loved and paid attention to. I am housetrained, know basic commands: sit, stay, come, roll over and can give “high fives”. I will go to the door and sit and whine to let you know I need to go outside. I walk very well on a leash and crate well. I am very playful and enjoy being around people. I am a really good girl and have so much potential. I am very agile and am capable of climbing 4’ fences (if left unattended) in order to be with people or other dogs on the other side that I might be interested in. I would probably make a good agility dog and a phenomenal walking partner. My Foster Mom thinks I am an absolute love. I am very alert and well aware of everything going on around me. I am just a happy-go-lucky girl. I am UTD on all vaccinations, heartworm negative and micro-chipped w/lifetime registration. So if you are looking for a new best friend, I just might be the girl for you. You must have a completely fenced and secure yard (not electric or invisible fence) in order to adopt me. I am currently being fostered in Imlay City, MI. Not cat friendly. **UPDATE: Sheba was adopted 10/1/17 by a very loving family in Chesterfield, MI. Sheba will be an only child but will enjoy spending her time with her new forever Mom & Dad, three young grandchildren, going on daily walks and camping.